Keeping the Pounds Off! : Need Another Reason to Give Up Soda? Need Another Reason to Give Up Soda? When I was a college freshman I drank one to two 64 oz bottles of diet soda each day - and many days did not eat anything until late in the evening. I was 'dieting.' I also got very sick from drinking so much aspartame and saccharine. I wasn't keeping the pounds off very well either. I gained 25 pounds by the time the freshman year was over. The Diet Soda Diet does not work! For the most part, I do not drink soda anymore. Not regular, not diet. I am not going to go into all the health reasons not to have soda. You can search those out yourself or do what I did: read something about the evils of soda written on the wall of a rest room and use it as the catalyst for changing my soda habit. Seriously - something written on the wall at a Curves, in the bathroom - it changed my soda habits. 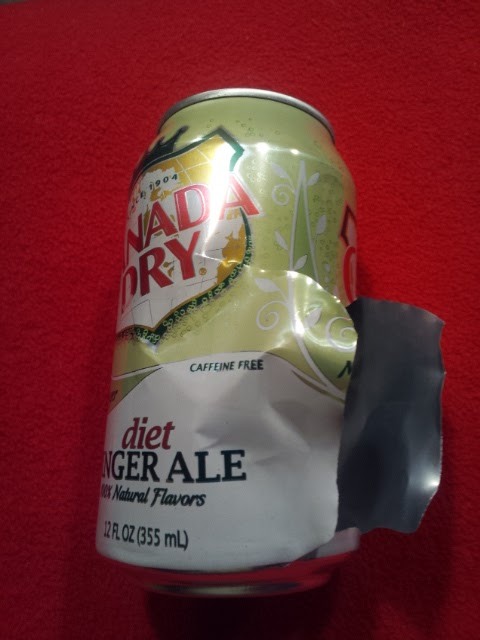 One bad habit I have developed this year is a nightly can of diet ginger-ale. I know I shouldn't have it. I have taken artificial sweetener out of my diet each day until 6pm when I have that soda. 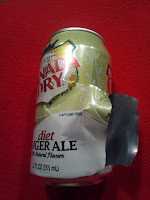 On Wednesday I was going out at 6:30 and felt like taking a can of diet ginger-ale. They are kept in the pantry closet, not in the fridge, so I filled a plastic cup with ice cubes, picked up the 12 oz can and left he house. I got into my car, put the cup of ice in the cup holder and transferred the still unopened can of soda from my left hand to my right when it happened. Luckily the force of the explosion was directed away from my face and fingers. It is a clear soda and not sugar loaded sticky liquid. The car has no damage, although it does smell like ginger-ale. I do not know what happened. Nothing was touching the can, except my fingers, and I have short nails. Thanks to the new AC in our house it was not hot in the pantry, house, or garage. Perhaps I need to take this as a message: If the soda will cause that kind of damage to the can, what is it doing inside my body? Right now we are out of diet ginger-ale. Let's see how long I can go without buying more. I am going to try giving it up one day at a time. Holy that is scary. Maybe it was the change in temp? Yep. I would count that as an omen if it just so happened it coincided with my desire to quite the exploding stuff. I have cut down on diet soda to one (sometimes two) a week. Each time I buy one I repeat to myself "You don't need this." Wow! What a strange thing to have happen. I also find it so interesting that I can so easily pick up a "new" habit. That's why I think food addictions start as habits. We think we have to have them. On the other hand, I don't think that one can of diet soda per day is such a bad thing, if it is satisfying and keeps us on track. I think it is only a "bad thing" when we have to have it more than that. I have also noticed that those of us with weight issues, are always trying to take something away from ourselves if we begin to enjoy it, even if it does not increase our weight. I'm trying to change that attitude for myself, because it becomes another struggle that I don't need, as well as another source of self-shame. I think that the acceptance of something that is pleasurable, but controlled, is OK, and perhaps good for us. This is just my perspective. I'm sure others have different thoughts on the topic. 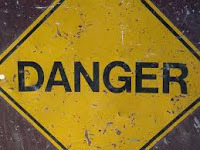 E. Jane: That works as long as we don't kid ourselves into thinking that pleasurable and controlled are always possible. If that were true, no one would be 50 pounds overweight, let alone 100+++. I don't think the diet soda keeps me on track. I think it is a crack into which crap will eventually pour. I drink red wine, in very limited portions and situations. Some people would find that horrible. I find it pleasurable and there are health properties in the small amounts. There is nothing healthy about diet soda. It is like saying a little tiny bit of arsenic is okay, as long as I enjoy it and control it. So true, Jane...there is no valid reason for drinking diet soda; it provides nothing of benefit and causes some immediate and many long-term detrimental effects. 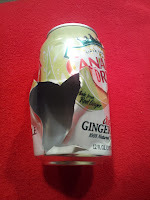 I am so happy to have broken that particular addiction (and I didn't even do it on purpose)...diet ginger ale, though, in my opinion, is the least of the soda evils, if someone's going to go that route. But explosions are scary! I left a can of diet Coke in my car overnight once years ago when a friend and I drove up to NH in February. The temps dropped to below zero. When we got into my car in the morning, there were shards of metal everywhere and slushy semi-frozen soda splatters. So extreme heat or cold is not good for carbonated canned beverages! Yeah, I lost Coke when I saw them pour it on a corroded battery and it ate away the gunk. It also cleans toilets, which is a safe use for it. Better than actual poison chemicals. yeah, right, coke is use for cleaning toilets . do not drink too much soda or coke if you want to be healthy then take care of your health. Aspartame makes my brain hurt if I drink too much of it. Makes my brain hurt. I find it pretty easy to avoid, b/c it's hard to justify drinking something, even in small quantities, THAT MAKES MY BRAIN HURT. I take club soda and add fresh-squeezed lime, fresh grated ginger, and 100% stevia. The latter won't work for you if you're trying to give up all sweeteners, but I haven't run into any issues with stevia... other than the cost. 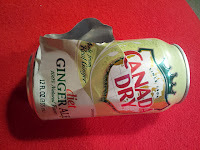 When I googled "what would cause cans of ginger ale to explode?" all kinds of links to "do not made homemade in glass bottles because of explosion" links, like the one I copied above, popped up. Who knew? I certainly didn't. I had a serious diet pop habit from college (1979) until I was pregnant with my oldest (1989) and then quit cold turkey because my doc did not want me ingesting any artificial sweetener. I never went back, but I had a couple serious run ins with colored pop over the years - grape, orange at root beer all at different times. The root beer one expanded to root beer floats and they were a real problem. When I think of pop, I always think of my husband's mother because she either drank diet pop or some form of alcohol. No water. And she was always very worried about calcium and bone density. Pop makes body unable to absorb calcium. so she was creating her own problem and had huge worries about it(but not enough to quit with the pop). Just to clarify my comment: I do not use diet sodas any longer, because both aspartame and splenda give me heart palpitations. But I know many people who do (mostly people in WW or OA HOW). They have made it work for them, and many have maintained their weight loss for many years. It's up to them to determine if "diet pop" is good for them or not. My comment about dieters giving up the foods they enjoy is based on my time in OA. (Weight Watchers don't do this, and I'm always amazed at how many "diet products" they ingest both during weight loss and maintenance.) I have known people to give up oatmeal (just one example) because they are enjoying it too much. I think that type of reaction is fear-based, but again I don't judge what another person has to do. I can't make anyone else lose weight by criticizing their food, unless they ask for an opinion. While I haven't totally given up drinking soda I have cut down to two or three 12 oz cans of diet cola per week. I use it as a treat rather than an everyday thing. If doesn't work for you then it's right that you stopped with your soda. I, despite my aspartame pregnancy, didn't because I know it doesn't affect me or my baby in any way.